It's not the reason I haven't made any posts this week, I don't really have an excuse for that. However, I have enjoyed the prompts which were all very accessible and quite easy to rustle up a conforming outfit for the day. 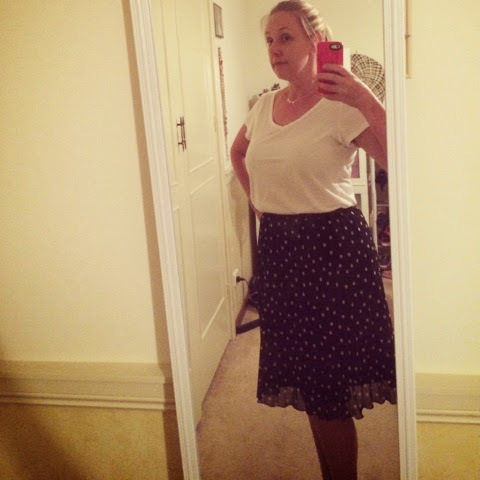 I re-rocked the outfit I wore in this post. The photos are better in that one. On this day I had very little time to myself to go out and get any photos so I was stuck with sneaking a mirror version after work. After identifying tropical as a gap in my wardrobe, I pulled out this navy bird print dress as the closest thing I had. I bought it at Rivers when considerably pregnant and hadn't worn it for a while. Two people complimented me on it so I guess it will get more run time this summer! I wore it with those ubiquitous white laser cut Rubi loafers and stuck a big white flower in my hair for that tropical feel. 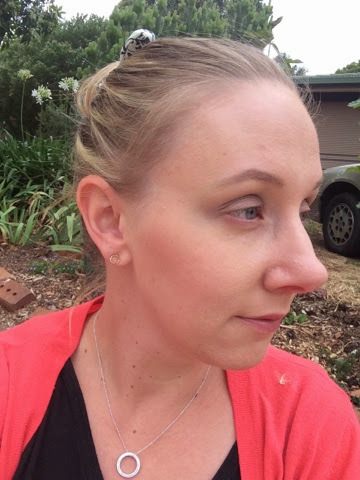 I've also got some pink frangipani earrings from Big W in. Day 3 - "Midweek Monochrome"
I had a few options that I was tossing up between here and settled on this because I thought it would be a cooler day than it ended up being . . . The spotty top is from Chicabooti. I like it because it has an elasticated waist that I wish I had pulled down a touch more for the photo but what can you do. I wore it with those bargain Review pants from Savers, cuffed 'em up and threw on a pair of Joanne Mercer heels for a little height. I went with pearl accessories to go with my white dots and that Pink All Up In Your Face lipstick I got last week at Priceline. Day 4 - "Floral Thursday"
I wanted something simple and easy to wear. Bang. A scuba floral-print dress, also from Chicabooti and, in fact, bought the same day as the spotted top above, some black Fiorelli sunglasses and Kiss Of Life Rimmel lipstick. It's a bit light on accessories . . . I was in a rush! I never thought I'd say it but I do dig this neoprene/scuba fabric. It's forgiving. Day 5 - "Printed Pants Friday"
I started off wearing another pair of pants and another black top. Changed the top. Changed the pants. Changed the shoes. Changed the necklace. 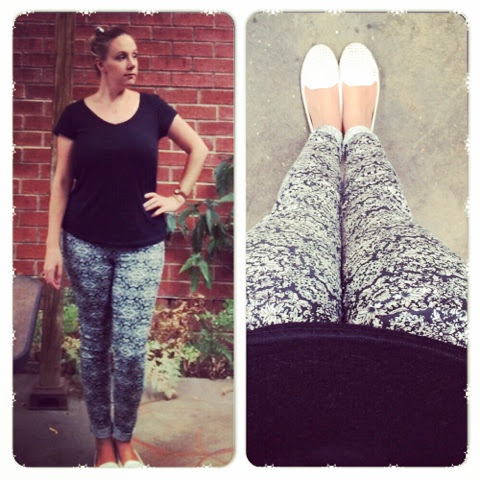 I ended up in another $5 Kmart tee, these printed pants from TEMT and those doggone Rubi flats again. I *really* need some new shoes. (My husband disagrees with this statement). I'm wearing Sportsgirl earrings and my Tiffany and Co necklace. I also added a coral cardi last minute, which this photo pointed out to me had some sort of yellow crust on the shoulder! EW. I'm also linking up with the Fashionable Mum's Friday Fashionomics. Why? Because all of these clothes are cheap, darling. I think the most expensive item pictured (besides watch and fine jewellery) are my Joanne Mercer heels and they were $49.95. Every other item of clothing is $30 or well under. Fashionomical! Thanks for joining in Beth.